In 2004 Limerick’s Life was created out of a passion for Limerick’s history and a desire to share that history with the general public. Over the years, the website has shared tales, photographs, collections, videos, lectures with the people of Limerick and those further afield, always with the motto of Read, Tell, Remember at the forefront. It is hoped that we have educated some and encouraged other to learn more about Limerick. 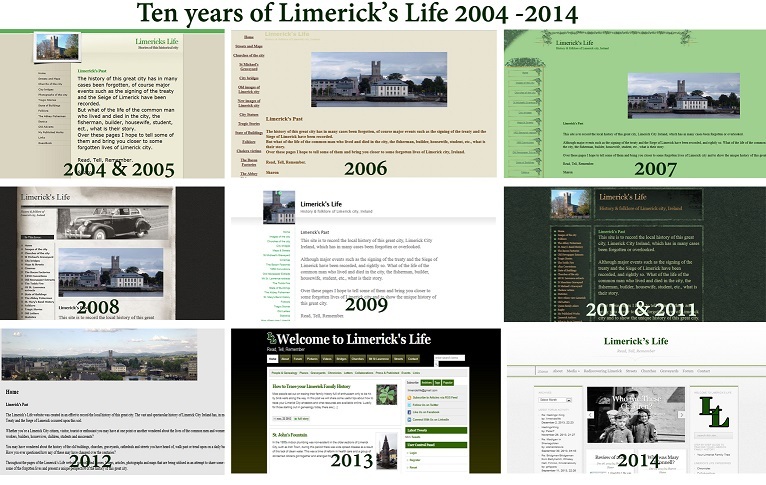 Over those ten years Limerick’s Life has seen many changes in how people use the internet, it is no longer viable to just have a stand alone web page as a result over the last few years we have branched out onto Facebook, Youtube, Instagram, Google+ and Twitter where we share short snippets and images relating to the city. It is our hope that Limerick’s Life will continue to grow and develop over the next 10 years, leaving a lasting legacy of interesting tales of this great city. Thank you Paula, I am glad you have enjoyed your visit and I hope you come back. I have just come across this site. It is fantastic! Full of interesting snippets and directions to further information about Limerick and people who have lived in the city. Thank you!